Several protesters could be spotted giving fascist salutes in Barcelona during a rally against Catalan independence on Sunday. The same scenes were captured on camera in Madrid where thousands of people gathered for the same cause on Saturday. 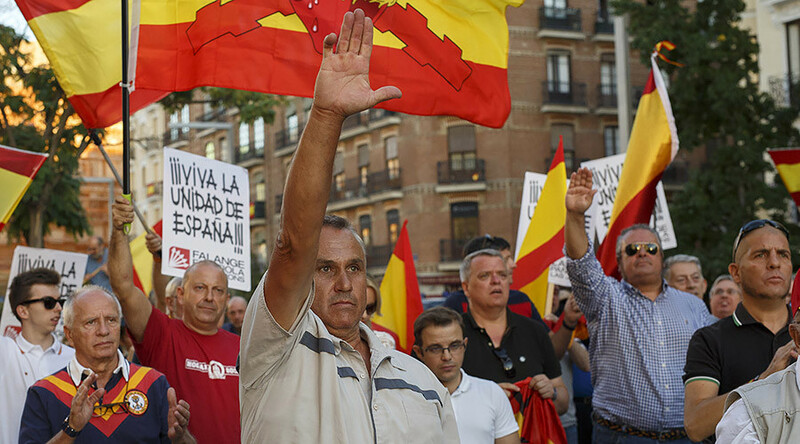 Saturday’s rally in Madrid saw thousands of people taking to the streets under the slogan “For the unity of Spain!” Some protesters performed Franco-era fascist salutes, as captured on the photographs. With Spanish flags hovering above, a number of men and women could be seen holding their right arms aloft in far-right salutes. Banners held by the protesters suggest the group belonged to the far-right Falangist party, which ruled Spain under General Francisco Franco. Hundreds of thousands of pro-Spanish unity protesters also took to the streets of Barcelona on Sunday. A group of unionists was filmed eagerly demonstrating the notorious Franco-era fascist salute to the cameras. The people waved Spanish flags and shouted at a group of Catalan police officers, who were sitting in their vehicle. The police were forced to back away from the protesters in reverse.